SICOM S.p.a. was incorporated in 1975 as an ISO container manufacturer for the domestic market mainly. Over the years, our ISO container range has been considerably enhanced to include all steel types, while, at the same time, commercial efforts have allowed us to widen our client base which includes major worldwide Shipping Lines and Containers Lessors, Intermodal Operators and Forwarding Companies. Since 1994, the range of products, such as 20ft and 40ft Open Top containers, Dry Box containers, Flat- Rack, Open Side, has been further enhanced with the 7.15 – 7,45 – 7.82 – 13.60 m. and 45ft Dry Bulk containers, Curtain Side Swap Bodies and Dry Van Swap Bodies. Our production range extends to all containerized facilities, also not used for the transport of goods, such as shelters and accommodation units, with special external and internal fittings and having a custom size. 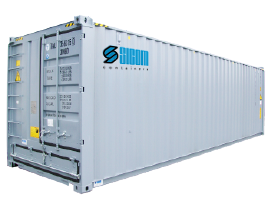 Since 2007 Sicom SpA has also been producing containerized accommodation units suitable for transport by sea, road and rail: these units are particularly suitable for use in difficult climatic conditions, typical of the remote areas of the world. All units are produced in compliance with the quality standards guaranteed by ISO 9001 certification. Our plant has a production capacity of 18,500 TEU spread over three production lines, which is achieved with a workforce of 100 employees and a turnover of about 30 million Euro. Our plant covers an area of over 200,000 square meters.